Who would have believed it? Bellaghy (County Londonderry, Northern Ireland) the site of an international tourist attraction! But it is. Bellaghy’s old, ugly, highly fortified, and forbidding police station, which I used to drive past in the early 70s, has been replaced by a gleaming new stone, glass and wood, arts centre, dubbed the ‘Seamus Heaney HomePlace’. Opened to the public on Sept. 30, 2016, the building is testament to the resolve and vision of the Mid-Ulster District Council to mark the life and literature of the village’s Nobel Prize winning poet, who passed away in 2013, and is buried in the nearby St Mary’s Parish graveyard. HomePlace was designed, and developed, in collaboration with Heaney’s widow, Marie, together with his children, and many of the contents on display have been donated by them. “The Council provided £3.25 million out of the £4.25 million capital costs, to build the centre”, HomePlace manager, Brian McCormick informs me. “It takes a further £1.5 million each year to operate”, he adds. That such a development was undertaken during a period in which there were swinging cuts to the Arts Budget throughout Northern Ireland, is nothing short of a miracle. While there is an expectation that the centre will break even, the benefit it brings to the local community is also of importance. 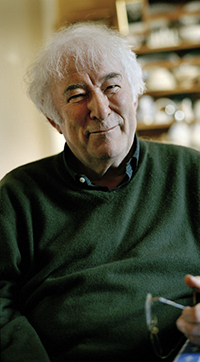 Seamus Heaney, an Irish Nobel Prizewinner in Literature in 1995, is one of the most famous literary giants in Ireland. To see myself, to set the darkness echoing." It was the rural landscape around Bellaghy, together with the family, friends and neighbours who influenced his boyhood and youth, providing the poet with a deep well of stimulation to which he returned again and again in his poems. “Bellaghy was Seamus’ Eden,” states McCormick. “He delved into the area and the people for his inspiration and HomePlace is the opportunity for visitors to immerse themselves in his world”. 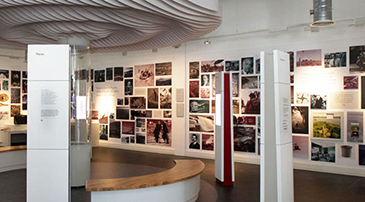 Built on two levels, the ground floor is devoted to Heaney’s life and poetry. The permanent exhibition entitled ‘Seamus Heaney: Man and Boy’, is dominated by photographs of the poet and enhanced by text which connects each photo to at least one of his poems. Visitors are able to follow Heaney through his life on the farm, primary school, boarding school in Londonderry, as a teacher in Belfast’s St Joseph’s College, through to the publication of his first volume of poetry, ‘Death of a Naturalist’ in 1966. By means of headphones, this journey is enhanced and embellished by listening to Heaney’s own voice. On display too, are objects and artifacts illustrating Heaney’s day-to-day life in Bellaghy. His primary school desk, his Uncle Peter’s leather money pouch which he adopted as his schoolbag, his duffel coat, a tractor seat, butter pats, a turnip snedder, and all the bric-a-brac associated with life in an Irish rural village. On one wall is a ‘poetry board’, designed to illustrate and explain just how Heaney embarked on his poetic process. Visitors are also encouraged to try their hand at composing a stanza or two and leave their efforts behind on the notice board. A ground-floor feature which fascinated me was the ‘word mobile’ – a suspended compendium of words from Heaney’s poems and those associated with the local neighbourhood. Some of these, such as ‘hoke’, I recognized, others, like ‘lachtar’ and ‘crenach’, were foreign to me, but all are part of our rich heritage. It is important that these words continue to be part of our lexicon, for, according to Heaney, “If you have the words, there’s always a chance that you’ll find the way”. I also liked the fact that no visitor to the centre need have their Heaney query go unanswered as there are expert staff on the floor, most of whom personally knew Heaney and are able and willing to address every possible question. Upstairs, on level two, is Heaney’s study, replete with his desk and original manuscripts. One wall is adorned by a copy of his Nobel Prize manuscript, and it is possible to view, on film, reactions to this award by the man himself, his wife, children and various leading cultural figures. There is also an extensive library displaying a substantial selection of his books, including translations of his works from over 20 countries around the world. Next to the HomePlace café, with its wide selection of locally produced fare, is the Helicon, an intimate 191-seater performance space. Thanks to some innovative arts programming, involving appearances by such luminaries as musician Glen Hansard, actor Adrian Dunbar and poet Paul Muldoon, the Helicon is well supported both by locals and visitors. HomePlace is also deeply involved in running primary and post-primary education programmes for Northern Ireland students. For example, a lecture series for GCSE students is designed to explore specific themes expressed by Heaney in his poetry. “We like to tailor what we offer to each stage of the education curriculum”, states McCormick. Perhaps it’s important to realize that while HomePlace pays tribute to the poet, it’s not just a Seamus Heaney exhibition, it’s more than that. This is a glorious space for community arts to happen and that’s a fantastic legacy to Heaney, something of which he would be very proud. I am reminded that English essayist and poet, Doctor Samuel Johnson once famously observed that the Giant’s Causeway was worth seeing, but not worth going to see. To paraphrase the great lexicographer, the Seamus Heaney HomePlace is definitely worth seeing, but it is also certainly worth going to see. Put it on your bucket list when you next visit Ireland.